Low yields are punishing investors. 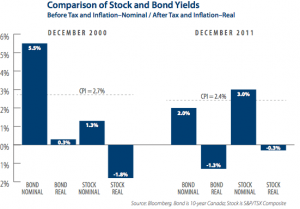 Compare yields on stocks with those of 10-year Government of Canada bonds. In today’s low interest-rate environment, the yield on a 10-year government bond is about 2%. By comparison, the yield on the S&P/TSX Composite is 3%. The fact that equities are yielding more than debt is a historical anomaly. The last time this situation occurred was in the early 1950s. Chart One compares the equity/bond yield situation at the end of 2000 and today. For each asset class, we present both the nominal yield, which is the pre-tax yield quoted in the financial press, and the after-tax, after-inflation yield, which represents the real, or true, purchasing power of the income received. The comparison is revealing. At the end of 2000, the government bond yielded 5.5% and inflation was at an annual rate of 2.7%. Assuming a 45.4% tax rate — today’s highest Ontario marginal tax rate — an investor would have earned a real cash yield of 0.3% on that bond, after tax and inflation. During the same period, the TSX dividend yield was 1.3%. Even with the benefit of the dividend tax credit, the after-tax and inflation yield on stocks was -1.8%. In 2000, and many years before and many years after, an income-oriented investor could buy a bond, earn the higher yield, and sleep with the perceived lower risk of a fixed income security. Such is not the case today. In an inflationary world similar to 2000, (December 2011 CPI of 2.4%; December 2000 CPI of 2.7%), the nominal yield on bonds is 2% and the real (after tax and inflation) cash yield is -1.3%. By comparison, the nominal yield on stocks is 3% while the real cash yield is -0.3%. At a dividend yield of 4%, available from most of the stocks comprising a Leon Frazer portfolio, the resulting real yield is 0.5% after tax and inflation. For a multitude of reasons, today’s yield and return environment is radically different from that seen in decades past. In a nutshell, we believe bond yields are low because investors perceive a “safety” in bonds that is driving monies towards fixed income and away from equities. At current yields, we believe this “safety” is far too expensive. From a risk/reward perspective, a higher-yielding stock can fall 1.8% per year and still generate a cash return equal to bonds. Over a 10-year period, an equity price decline of greater than 20% (1.8% compounded for ten years) is a statistically rare event, especially for blue-chip equities. As investors, we look at the long-term and find the argument for dividend-paying equities compelling on a stand-alone basis, let alone compared to bonds. While today’s month-to-month volatility is high and concerns about the global economy are rampant, we find great comfort knowing when risks are perceived to be at their highest (the reason stocks yield so much and bonds so little), the potential for long-term returns are greatest.